DLT Pinned climbing jack systems are very similar in principle to our strand jacks systems, and can be used with our standard hydraulic power packs and control systems. 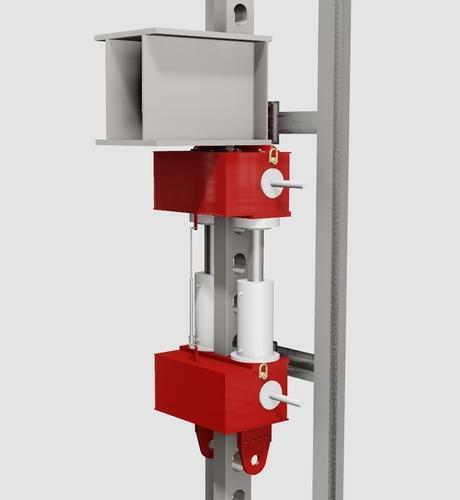 DLT pinned climbing jacks have top and bottom anchor blocks separated by a pair of hydraulic rams and climb a modular pin plate that transfers the load in compression down to a foundation plate. The top and bottom anchors have secure pinned connections to the pin plate. The pin plate is secured by lateral restrain clips to any suitable structure such as a temporary tower, a building column of a bridge pier. Our DL-CP pinned climbing jacks vary from 60 - 1000 tonnes safe working load per jack. Lifting speeds vary from 5 - 40 metres per hour depending on the size of power pack used. Our DL-CP pinned climbing jacks can be used vertically to lift and lower heavy loads and can also be used horizontally to push heavy loads along a skid track. We are designers and manufacturers of heavy lifting equipment, hydraulic jacking systems, mechanised structures and steel bridges. To compliment our product range we also offer construction engineering and site supervision services. Our role on most projects is to develop solutions to construction problems, fully engineer these solutions and then to work with our customers to carry out the operations on site. We are happy to offer any combination of erection engineering, equipment supply / rental and site supervision services to suit the needs of each project.